The tea table and the coffee table were introduced to America approximately 200 years apart. 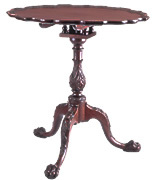 The tea table - with a tilt-top, central pedestal, and three legs - was first made in America by immigrant British craftsmen in the 1720s. Along with tea itself, the new form spread rapidly and brought a new air of domestic sociability to the American home. 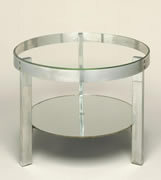 The coffee table, invented in the 1920s, was distinguished by its low, informal height and expansive surface. It became such an important part of the mid-century American living room that it led to the creation of a new type of literature: the "coffee table book." This exhibition compares the parallel developments of these familiar furniture forms, and includes tea and coffee services from each period as well as prime examples of the tables themselves. The exhibition is organized by the Milwaukee Art Museum and curated by Glenn Adamson, curator of the Chipstone Foundation and MAM adjunct curator, and Sarah Fayen, assistant curator of the Chipstone Foundation and MAM adjunct curator. 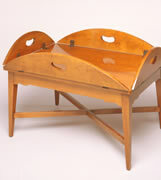 Imperial Furniture Company (Grand Rapids, Michigan), Coffee Table, 1929-53. Cherry and plywood. Lent by a private collection. Photo John R. Glembin. Chicago, Illinois, Coffee Table, 1934. Chrome-plated metal and glass. Lent by Julia and George Evans. Photo John R. Glembin.